Over the past nearly 80 years, the Sport Fishing and Wildlife Restoration programs (authorized by the Pittman-Robertson & Dingle-Johnson Acts) have provided well over fifteen billion dollars in grant funds to state fish and wildlife agencies for projects to restore, conserve, manage, and enhance all species of fish and wildlife – $1.1 billion will be distributed this year alone. 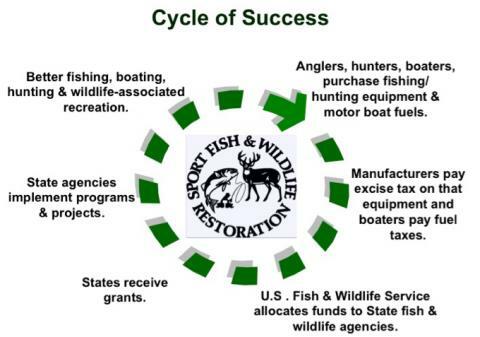 A system has been driven by this “cycle of success.” 1) anglers, hunters, boaters purchase fishing/hunting equipment & boat fuels. 2) Manufacturers pay an excise tax on that equipment and boaters pay fuel tax. 3) U.S. Fish & Wildlife Service allocates funds to State fish & wildlife agencies. 4) States receive grants. 5) State agencies implement approved programs & projects. 6) Better hunting, fishing, boating & wildlife-associated recreation results. 7) Do it all over again.